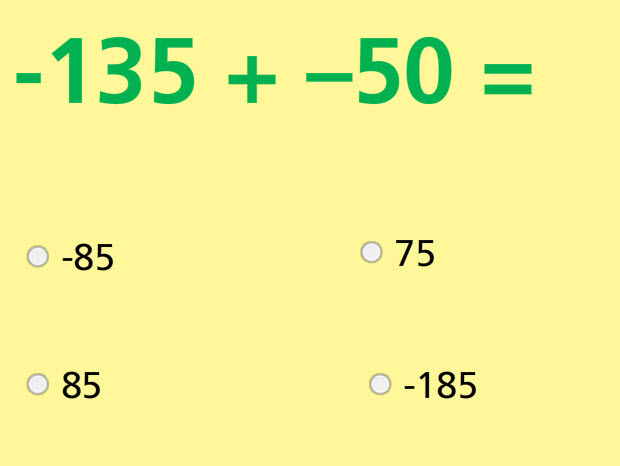 The multiple choice problems, and the drag-and-drop questions in this online test are designed to give children a variety of addition and subtraction problems. Check how well you can add and subtract integers by taking this interactive online quiz! This test challenges the students' knowledge of operating with positive and negative integers. Return from this Add and Subtract Integers Math Test to the Middle School Math Tests , 7th Grade Math Tests webpage, or to Math Tests.